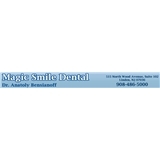 Magic Smile Dental (Linden) - Book Appointment Online! I am a big chicken when it comes to the dentist. Dr Anatoly was so comforting and patient with me when it came to my fears and concerns. He assured me that he would be as gentle and quick as possible and that he was. I highly recommend him and everyone at the office when it comes to dental care.